With 5 Pantry Staples You Can Have A Delicious Dinner In No Time! Chicken really is a tried-and-true standby for simple weeknight dinners, but we’re always looking for new ways to revamp this main dish staple. 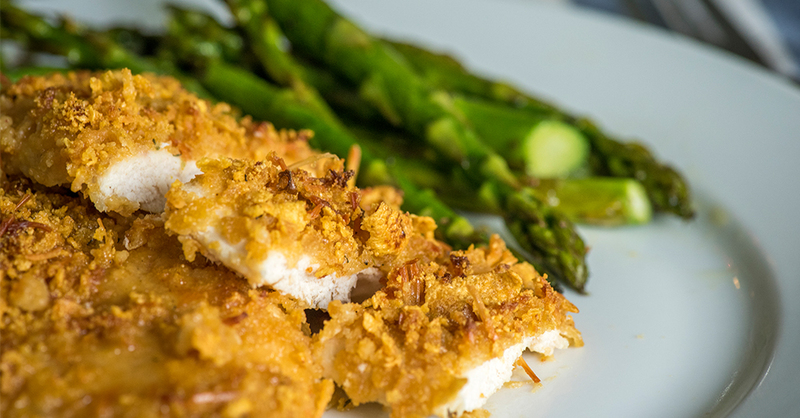 That’s where this recipe comes in handy – it only takes five ingredients to whip up some of the crispiest and juiciest chicken we’ve ever had! The coating is loaded up with ranch seasoning, a perennial favorite in our home. You can buy premade packets, or use this recipe to make your own from scratch. Either way, both adults and kids will be head over heals for this crispy and flavorful oven baked goodness! Preheat oven to 375º F and lightly grease a 9x13-inch baking dish with non-stick spray. In a large, re-sealable baggie, mix together crushed corn flakes, parmesan cheese and dry ranch mix. Seal bag and shake to combine. Pour melted butter into a shallow dish and dip each chicken breast so each side is covered in butter. Shake off excess, then place each chicken breast (one by one) in corn flake baggie. Seal bag and shake vigorously, until chicken is completely coated. Repeat with remaining chicken and transfer to greased baking dish. Sprinkle remaining cornflake mixture over the tops of the chicken.